Probably the simplest bread recipe. Soft and fluffy, with a yellowish crumb and a chewy crust, this bread is perfect for PB&J or deli sandwiches, and even for making French toast. In large bowl, dissolve 1 tsp sugar in ½ cup warm water. Stir in yeast; let stand for 10 minutes, or until foamy. Whisk in 1½ cups water, milk, remaining sugar, egg and butter. Add 3 cups flour and salt; mix until smooth. Add another 4½ cups flour. Stir briskly with wooden spoon until well mixed. If necessary, gradually add remaining ½ cup flour to make soft dough. On lightly floured surface, knead dough about 8 - 10 minutes, until smooth and elastic. Cover; let rest in warm place for 10 minutes. Punch dough down. Place on lightly floured surface and flatten with your hands to a square about 1-inch thick. Cut into four equal pieces. Take a piece of dough and roll out to a 8½-inch rectangle. Starting with the long end, tightly roll up jelly-roll style. Pinch seams and ends to seal. Place seam down in loaf pan and repeat with remaining 3 pieces. Cover and let rise in warm place until doubled in size - about 45 minutes. Note: If you prefer you can mix all the flour in with a wooden spoon, but the result will be an airy texture and a somewhat uneven top crust. You can substitute Instant (fast-rising) Yeast in place of Active Dry Yeast. When using Instant Yeast, expect your dough to rise faster. Always let your dough rise until ripe. Traditional methods: use equal amounts; Bread Machine: use ½ tsp Instant Yeast OR ¾ tsp Active Dry Yeast per cup of flour in your recipe. Visit our Lessons in Yeast & Baking for more information. First time using Red Star have always used another brand. I could tell a big difference starting with activation. It smells amazing. Like you really know it’s active. Big difference from others! Hi do you have to use bread flour or can you use plain flour? Thank you. We recommend using bread flour in this recipe due to its higher protein content / better gluten forming properties. However, you could use all-purpose flour. The dough may need less liquids due to the lower protein in all-purpose flour, and you may not get as high of volume in the finished bread. Just double checking on this recipe. It says to knead and then let it sit 10 minutes in a warm place without any further proofing, then you shape it and put it in the pans. Most recipes have a long proofing time following the kneading, so I’m wondering if a step is missing. Thanks. Yes, this step is correct as written. However, you may let it rise until doubled in size if you desire before shaping. This bread recipe is perfect! I even left out 1 teaspoon of the salt by accident and it was still amazing. Bread making is a science and quite a bit of work so it is great that you get 4 loaves out of it. Thank you Red Star! Hi. In this recipe for White Bread #2, how warm should the water and the milk be? The liquids should be 110-115 degrees F. More tips on how to activate yeast can be found here >> https://redstaryeast.com/yeast-baking-lessons/baking-steps-guide/prepare-your-yeast/. Great recipe! I’ve been in search of the perfect sandwich bread, and I think I’ve found it! I’ve been making my family’s bread for the past 6 months, and this recipe is going to be our new keeper. I like that it makes 4 loaves because I’ll keep one out for now and freeze the other 3 loaves. I also like the addition of milk, egg, and melted butter to this recipe. It makes for a much moister crumb and a richer tasting bread. 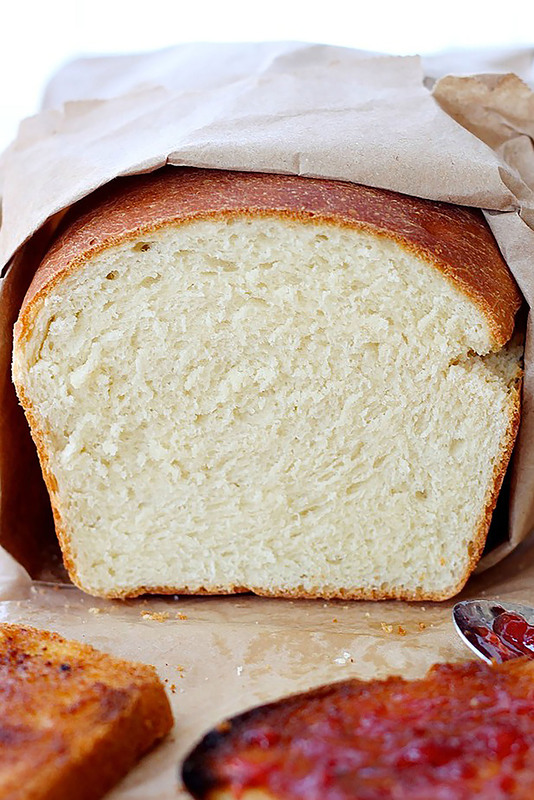 I’ve been searching for the perfect white bread loaf, and this is it! I love baking bread, many different varieties, but there are times that I crave good ‘ole white hearty sandwich bread. I’ve tried so many different recipes, but as far as hearty white bread goes…I only need this one. I make it often, it’s so easy, and I even love the amounts listed here because I make 2 large 2 pound loaves out of this. My loaf pans are large (12 x 4.5 x 3.125) – the small loaves go just too fast! lol the cooking time is the same – 30 minutes. Thanks for this great bread recipe! Here’s the link again: https://redstaryeast.com/lessons-yeast-baking/postpone-baking. Hopefully this one will work. Check out our Lessons in Yeast & Baking section for lots of great baking tips. Has freezing the bread been tested? with this making 4 loaves it would me amazing to be able to make all 4, bake 1 and freeze the other 3 until needed so the bread is always fresh. I typically freeze before the final rise but I’ve found not all recipes recover from freezing equally. I am trying to figure out if it is calling for 6 and 3/4 tsp of yeast or if it means (6) 3/4 tsp of yeast? Thats the only part of this recipe that confused me and I really want to try to make this recipe today!. Use 6 and 3/4 teaspoons (3 packets) of yeast for the recipe. Happy baking!